Clean, spacious, waterfront house. Back porch overlooks canal, dock, and outdoor fireplace (chimney). Double capacity sit-on-top kayak included. Paddle the pristine waters of the Halls River. Surrounding land is Federal Bird Wildlife Sanctuary. Halls River connects to Homosassa River, winter home of the manatees. Fish off the dock. Large living room area with cathedral ceiling. Open kitchen with divider bar and sliding-glass doors to back porch create spacious gathering area. Pets are NOT allowed, No Smoking. 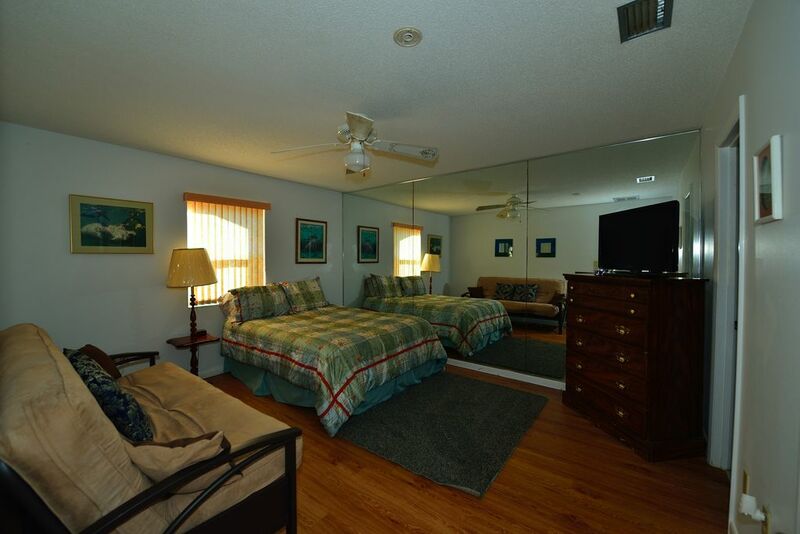 Located off Highway 19 between Crystal River and Homosassa. Home owned by Birds Underwater Dive Center. See their website. When you rental one of our houses you also get 10% off a manatee tour with Bird's Underwater and 10% off a scalloping tour (July - Sept)as well as use of the kayaks at Bird's Underwater that is located on King's Bay. Three additional stools at counter for eating. The screened in porch also has a dining table and four chairs. We had a blast!! Our kids caught fish off the dock for the first time. We went out on the John boat and kayaks!! The water was clear and we saw a lot of fish and turtles!! The house was very spacious and relaxing!! We will definitely be back!! Thank you for the kind response. I think the fish are trained, they are guaranteed to bit, my kids use bacon! We will leave the light on for ya. We enjoyed our stay in this spacious house, especially the screened porch where we had our coffee in the morning and enjoyed happy hour in the afternoon. Despite its proximity to the highway, it was quiet and peaceful. We slept well on the comfortable bed in the master bedroom. It’s the cookware in the kitchen that keeps me from giving 5 stars. The one pot adequate for cooking pasta had a loose handle, with one screw missing, making it very risky to carry it full of hot water to the sink. There is a new cooktop stove but the skillets and the 2 pots are warped on the bottom and don’t sit flat on the stove. The kitchen is otherwise well stocked and we did appreciate having wine glasses. We loved watching the fish and turtles in the canal. On our first morning I even saw a manatee! I took one of the kayaks out for a short trip but, as seniors, we found it challenging to get in and out of the kayak off the dock. Younger people would probably have less difficulty. There is lots to see and plenty of restaurants. We wouldn’t hesitate to stay here again if we’re back in the area. We love to visit this area. We are outdoors people and there are numerous parks and refuges along the coast. This place is located perfectly for making day trips. Very clean and comfortable. Great amenities, everything works! Enjoyed grilling steaks on the gas grill for Valentines Day. The home is spacious, light, well stocked, private, a great fit for our group of four. Complimentary wine, lots of linens and towels, w/d, fun decor, spacious common areas, terrific screen room, lots of kayaks, so many pluses. Life jackets small and of the old orange style. Outdoor fireplace gas lighting control malfunctioned but we didn’t miss it all that much. Our 2 night stay was great. We’ll be back. The house is clean and the kitchen was equipped with all we needed. We spent our days kayaking surrounded by a pod of manatees and sitting by the fire pit directly on the water. Perfect size for a family of four. Thank you so much for your review. That is my favorite rental, glad you took advantage of the porch, hopefully kayaked and built a fire, we will leave the light on for you. Book early in high season. We request a two night minimum in high season. Check in at Bird's Underwater, 300 NW US HWY 19, before 5:00 pm to get the key. If you can not make it before that time please contact us, in advance, for lock box information and directions. For the privacy of our clients we do not provide driving directions on line. We do not want drive by’s. Guests must call the shop for directions and get the key as well.